I love the types of “recipes” that aren’t really recipes at all. They are so flexible that, as long as you sort of have the right ratios in place, it really doesn’t matter exactly how much you add. It’s all to taste, anyway. 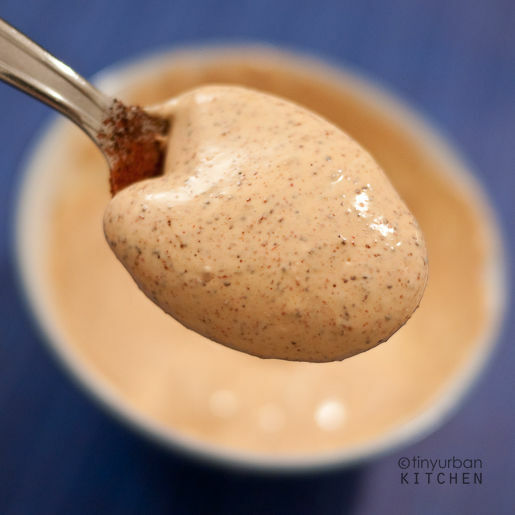 This chili mayo sauce is just like that. It’s made up of just five simple ingredients and tastes fantastic on fish tacos. I recently tried making fish tacos two ways: grilled and fried. This sauce livens up either kind. I love how it’s easy to make, and you can tweak the flavors depending on what kind of chili powders and chili sauces you have on hand. It looks like a great dipping sauce! Fuji Mama – I totally do the same thing with the srirachi sauce! But when I’m doing more Asian-like dishes. In fact, my mom catered sushi to supermarkets for years, and those spicy rolls were totally made with a sauce made from srirachi, mayo, a touch of sesame oil! I love this on everything!! I’ve just started experimenting with making my own rolled sushi. This would be fabulous in a roll. That taco looks pretty good. Made a white bean burrito the other day and used your pico an this spicy mayo to top. Freaking simple and beautiful. The main thing I want to thank you for is reminding me of how much I love chipotle flavor. I’m with Cathy on this one, I want to put this on everything. I’ll be hitting up your grilled fish taco recipe too soon. I made homemade whole wheat tortillas too which made the dish even more the awesome. Love your photos too! Thanks! could you give me a guestimate on how big your “part” is? Starting with parts and finishing with discreet amounts is hard to replicate. I made it once and it was fabulous, but I didn’t write down what I did. Then I made it again and it was too strong in the spice/lime area – it would be helpful if you let me know roughly how much sour cream and mayo you generally use. Thanks! i used 4 tablespoons of sour cream and 2 tbsp of mayo with 1 tsp each of the chili sauce and powder. just the right spice. Christine – thanks for the tip. I’m still quite a newbie at recipe writing, so any feedback is helpful. I don’t remember the exact amounts I used, but I think “Anonymous” (who posted right after you did) has the right idea. Based on the 1st picture (which is of a small Chinese rice bowl), I would guess it was about 3-4 tablespoons of sour cream and 1.5 to 2 tablespoons of mayo. Hope this helps! It does – thanks. I know this was not supposed to be a recipe really, but it helps when things are all in parts or all in measurements, as the ratios are important. The second time I made it I only had about 2 TBS of sour cream in the house, and I stupidly just added the full amounts of the spices without tasting. I’ll save this recipe now, as it’s a great one! Whenever I have a recipe that calls for chipotles in adobo, there’s always a lot left in the can. So, I blend them together in my little food processor and keep it in a jar in the fridge (it seems to last for ages). That’s what I used for the chipotle sauce, and it’s a great add in for all Mexican recipes. Thanks again! A “part” is just how much you decide. Example: If you use 1 cup of Sour cream, that would mean that a 1/2 cup= 1 part. So 1 cup sour cream, 1/2 cup mayo, etc. Stupid question (sorry), what kind of chili sauce? I don’t think I have ever see chipotle chili sauce. I think what she meant was it’s confusing the way you start with measuring parts (1 part mayo) and then end with exact measurements (tsp chili sauce). Thats a pretty large ballpark say my “part” is 3 cups sour cream and 1.5 cups mayo, 1tsp of chili powder isn’t going to flavor it much. Catch what I’m saying? Looks so yummy. I pinned this & hope to try it out soon. Thanks for sharing. So yummy!! Our new favorite for shrimp tacos!!! I love this recipe!! My hubby doesn’t like mayo, so I substituted mayo for hummus. It gave the sauce a great texture. I also used chipolte in adobo. I used the sauce, but I imagine if you wanted a lot of spice you could chop one of those bad boys and put it in! Thanks so much!! Your Chili Mayo Sauce works really great with sweetpotato fries by the way, i tried it today and it is just marvelous. Can you tell me how long this would keep in the fridge please as I am the only one who would eat it…. It should last as long as the expiration of either the sour cream or the mayo is my guess. My daughter wanted shrimp tacos tonight but I didn’t have any sauce for them. I started looking around and found your recipe. I have to be honest…I didn’t really measure out any of the ingredients but it still turned out delicious!! That flavor combo is perfect! The only change I made (because I know the flavors we like) is that instead of salt and pepper I used a couple dashes of garlic salt and cayenne pepper. We LOVED this sauce!! I could eat it by the spoonful! Thank you.